I know we may not be ready to think about it, but none of us can hide from all those Back to School sales. Are you thinking about how to get the year started yet? (Okay, I’ll confess that I’m still mostly in denial.) Over the years, I have created quite a few different activities for the first week of school : some are music-themed, some are more focused on learning in general. Last summer, I packed up my home and moved, so I’ve spent the last year-and-a-half going over my piles and piles (and boxes and boxes, and drawers and drawers) full of teaching materials that I’ve collected and created over the years. 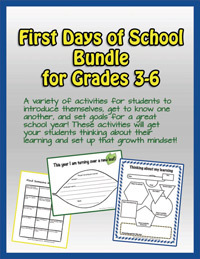 I’ve started digitizing them and putting them up on Teachers Pay Teachers®–sharing the love! 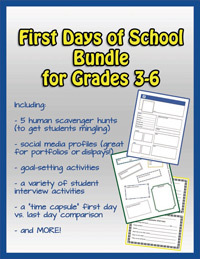 So if you are looking for some great activities for those first days, check out this bundle. Every year I try something new—and usually something different for each grade—hence the huge pile of activities. This is only the tip of the iceberg; I’ve got two more folders full of papers from the first week of school. Not to change my habits, I’m still looking for inspiration for this August. As a specialist, do you focus on general “getting to know you” activities, set learning goals, or start engaging with music right away?